Safe Systems provides many security options for businesses in all phases of operation. One great example is the new Punch Bowl Social renovation project in Denver. 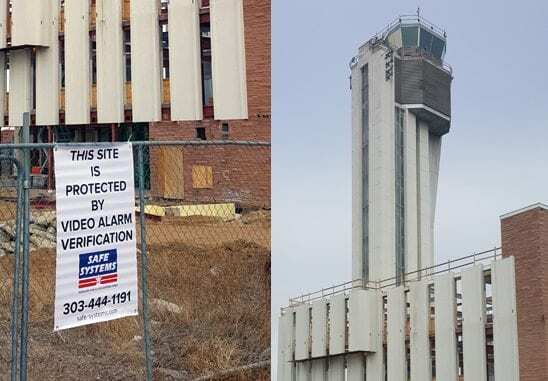 The growing restaurant chain plans to re-develop Stapleton’s iconic airport control tower. The site has been vacant for about 20 years. The tower itself will remain intact as the overall structure around it will expand to accommodate a large patio, corporate offices, restaurant, and bowling lanes. Safe Systems is protecting the new Punch Bowl Social‘s construction with Video Verification. The wireless solution is ideal for protecting particular areas that need portable camera coverage and motion detection. Security requirements at the site will change over time. The Punch Bowl Social project requires a security system that can be moved or expanded as development progresses. Safe Systems understands that it is critical to secure tools and building supplies overnight when the site is most vulnerable. This project demonstrates where practical alarm expertise combines with technology to provide a right-sized, cost-effective solution. The sales team at Safe Systems is passionate about protecting lives and property.